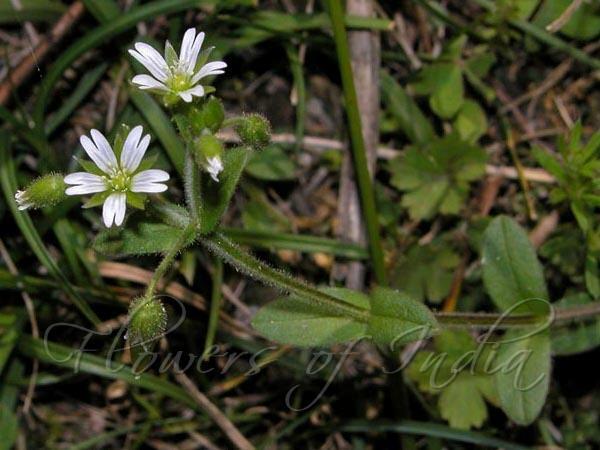 Sticky Chickweed is a cosmopolitan weed found in some hill-stations in North India, which probably came from Eurasia. 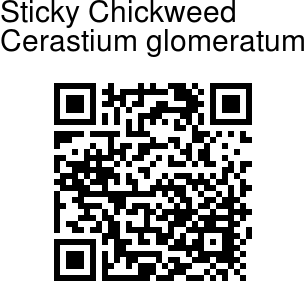 It is an annual herb 10-35 cm tall. Stem are simple or branched, erect to rising. Stems are hairy, often on one side. Leaves are 1-2 cm long, 3-7 mm broad, obovate-elliptic to lanceshaped-elliptic, sparsely or densely hairy, with a pointed to blunt tip and stalkless base. Bracts are herbacious. Flower stalk is densely glandular-hairy, shorter or as long as the sepal-cup. Flowers are borne in roundish heads at the end of branches. Sepals are 4-5 mm long, lance-shaped, glandular-hairy, often tinged purple. Petals are white, as long as or slightly shorter than the sepals. deeply notched at the tip. Capsule is 1.5-2 times the sepal-cup length. Flowering: April-July.